I hate to see the roadsides littered with trash. It’s been driving me crazy since I was a little girl. I’ll never forget the time my family was traveling to the beach for sumer vacation. The side door of the Chevy van creeping along in front of us suddenly flew open and someone shoved a large garbage bag full of trash onto the road. I was so upset that my Dad recorded the license plate number for me and I wrote a letter to the VDOT in my own words and in my own handwriting. Several weeks later I received a reply telling me how much they appreciated my concern, but there was nothing they could do. Wait a minute…heaven has helped us. A year ago, on the day before Resurrection Sunday, I donned my sturdy rain boots, my old flannel shirt and some thick rubber gloves and trekked a few hundred yards down the street from my house with a dozen trash bags. The edge of the fields were lined with trash on both sides of the road. It was making me sick to my stomach. How can I complain about it if I don’t do something about it? I don’t litter. When I was a little girl, my Dad took me to visit a family in our church. I loved going to the Masons. They lived on a farm, complete with chickens and cows. My Dad was–still is–a Baptist minister and I enjoyed going on visitation with him, but the Masons were really special. They lived in an old farm house and there was just something wonderful about the way they loved on me. I had no thought that tissue would blow away. How could it possibly blow out of my hand when I was gripping it with all my might? But fly away, it did. I cried because I had to sit in the car while my daddy visited some of my favorite people. To me, that car became a tomb because I was missing the fun. I’ve never littered since. What an unusual thing to hear from God while picking up trash, but as I pondered I realized that God was giving me this beautiful picture of new life. As I filled bag after bag with broken bottles, crumbled paper and fast food bags I began to see more of the green earth and less of the garbage. Not only did I see fresh new grass, but I saw beautiful dainty, lavender flowers covering the ground and pale yellow flowers growing from wild cress. I also found a few old bottles I cleaned up and turned into flower vases. When I had removed all the trash I stood back and beamed with pride. It looked like a new highway. All that trash distracted me from the real beauty of God’s creation. I wonder if anyone else noticed. How could they not? All of the world’s trash was dumped on Jesus. All my sin, all your sin, all humanity’s sin. In one giant heap. Like a garbage dump. There was nothing beautiful about the Cross. 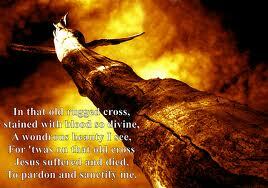 Before Christ was even nailed to those beams He was chained, beaten, whipped, scourged, spat upon and cursed. With every crack of the whip I wonder if He was thinking, “Behold, I’m making all things new.” If I had seen His body I probably wouldn’t have believed it could ever be healed. I wouldn’t have believed He could ever have been made whole again. I wouldn’t have believed something wonderful, something beautiful, something new could’ve come from the Cross. But it did. I know because to Him I’m something wonderful, something beautiful, something new. He came to me in all His resurrected glory and showed me how to pick up the broken pieces of my life. He came and freed me from sin and released me from the tomb of death. He came to bring me life and I don’t want to hang onto my trash so tightly that I miss the abundant life He offers me.